Budapest is the capital of Hungary. As the largest city of Hungary, It is the country's principal political, cultural, commercial, industrial, and transportation centre. 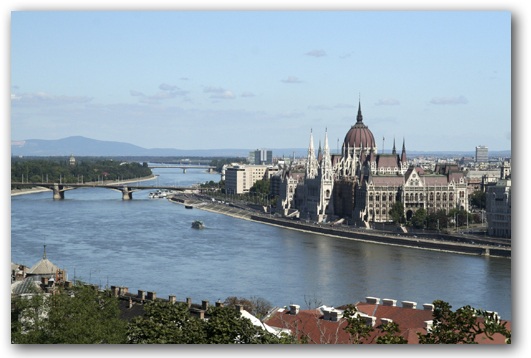 Budapest is bisected by the River Danube. The city is as much a natural geographical centre as it is the country's transport hub. Budapest possesses a rich and fascinating history, as well as a vibrant cultural heritage. Recognizing the unique value of its traditions, it has managed to maintain its magic and charm, and is known as the "Queen of the Danube". It has also been called the "City of Spas", as there are a dozen thermal baths complexes served by over a hundred natural thermal springs. Budapest is rich in UNESCO World Heritage sites: the view of the Danube embankments, the Buda Castle District, Andrássy Avenue with Heroes' Square and the Millennium Underground Railway are now internationally protected areas of the Hungarian capital. An early form of the "Museum Mile" concept, popular in some U.S. cities, had been brought to life in Budapest. A massive, simultaneous construction boom allowed architects and decision makers to concentrate their efforts between 1860 and 1910. The cultural attractions that belong to the avenue aren't all located within the same street or quarter, but rather are along a vertical axis comprising the Buda Castle District, Andrássy Avenue and the City Park. The City Park (Városliget in Hungarian) is packed with things to do and places to see. Widely regarded as one of the most beautiful cities in Europe, Budapest's World Heritage Sites include the riverbanks of the Danube, the Buda Castle Quarter, Andrássy Avenue, and the Millennium Underground railway, the first on the European continent. Built between 1885 and 1904, the Parliament building soon became the symbol of the Hungarian capital. Not just because it's sheer size – nearly 18000 square meters – but also because of its detailed decoration, inside splendor and eclectic diversity. Saint Stephen's Basilica is the largest Roman Catholic Church in Budapest. It has the second highest ecclesiastical status in Hungary. The Castle district of Budapest reflects a medieval atmosphere with its picturesque narrow streets and old citizen houses. The Royal Palace houses different museums and exhibitions. Allow yourself time to walk around.